The installation and maintenance of intruder alarm systems has been our business for more than 25 years and we install professionally to the highest standards. We are SSAIB accredited, accepted by all insurers and registered with Police so that our systems can receive Police response. We install hard wired, hybrid and fully wireless systems, with or without signalling. We offer a complete suite of monitoring services, from self-monitoring options to encrypted dual-path signalling via our secure Alarm Receiving Centre. 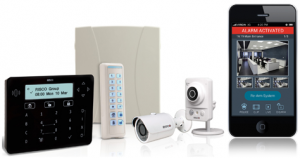 Self-monitored systems include speech diallers, text message GSM units and the award-winning iRISCO app with activation alerts, picture and live video verification directly to your smartphone, also giving yout the ability to fully control your alarm remotely from anywhere. For professional Alarm Receiving Centre monitoring we can provide all types of connections ranging from standard Digital Communicators to more advanced and secure dual-path signalling systems such as Dualcom GPRS and Redcare GSM (EN Grades 2-4). At Security First (UK) we understand that every client or building has individual security needs. Even identical properties may require different alarm system designs. We will always conduct a simple risk assessment and survey and provide you with a detailed specification in accordance with our recommendations and your requirements. At survey stage we explain to you the reason behind our design, and following installation the engineer will explain everything you need to know about correctly operating your system so that you have full confidence in using it day to day. All our systems are designed with user-friendliness in mind and we never oversell you equipment that you do not need. Security First (UK) is certified by the SSAIB for the installation of Intruder Alarms, CCTV and Access Control systems. We are a RISCO Group Solution Provider.